To know that every moment -- regardless of how it comes wrapped -- is a gift greater than you can give yourself, is to be well on your way to a life without fear. Our usual reaction to any event not of our choosing is to fear it, so that our tendency is to see these experiences as being adversarial. These unwanted moments are seen as threats to our present happiness, as well as being a thorn in our tomorrow, because with any unwanted event comes the fear of not having the right answers to address the flood of new questions arising out of life's sudden turn. But what if what we think is the truth of these moments is not the truth at all? What if it were possible to see the truth of these moments in a whole new light? Imagine if we could know in any of these given moments that life isn't handing us a bunch of do-or-die questions upon which hinge happiness or defeat -- that our unwanted experiences don't deliver us into our enemy's hands, but lead us instead to living answers whose soul purpose is to help us realize the great Friend we have in Truth? Wouldn't such a reality, once realized, end those nagging fears that ride the dark tailcoat of the unexpected? And wouldn't the end of these fears be the same as being free to live fearlessly? Of course! And, as we are about to find out, this is precisely the case. Experience reveals that the actual nature of any painful moment in life has little to do with what we first blame our pain upon. For example, that "She wants to leave me" isn't the real pain; the real pain is that if she does, it means there has to be something "wrong" with me. Besides, without her in my life as she has been, I won't know what to do with myself; I'll be uncertain as to the worth of who I am, or how I should view myself. And so, being in fear of having to deal with what feels akin to the end of ourselves, we resist or deny anything that threatens us with such an untimely demise. At this stage, our general response is to make unwanted compromises with ourselves, or otherwise somehow grovel to keep the passing relationship alive. However, try as we might, what will come to pass does just that. Maybe it takes years, months, or maybe only days, but we are slowly dragged through the doorway of a life lesson that is no longer avoidable. And what do we invariably find? Behind each of these seeming impossible moments stands an unseen (at the time) purpose: to bring us to a certain realization or experience of the truth about our self. But while this medicine may be bitter, it also heals us. How? For starters, we realize (in hindsight!) that what has transpired was not only a gift in disguise, but that we are much better off for having worked our way through its challenging wrapping! Now we understand, beyond the shadow of any doubt, that we couldn't begin the next level of our life journey until we had completed these lessons now behind us. In other words, it's clear to us that what we first fought so hard to avoid was really a truth come to rescue us from self-ignorance -- a truth that not only explained why our lives were as they were, thus freeing us from a mistaken sense of self, but in the same moment set the stage for our further self-development. Can you see the truth of this recurring set of conditions and how it continually manifests itself through the course of our life experiences? We have reached the threshold of the Great Truth. We have realized that our experiences in life ultimately serve the purpose of revealing some unseen truth about us, to us. As this is the truth, amply evidenced by our own accounting, then can we not begin to perceive that these very experiences, regardless of their content, must be an expression of the truth for the purpose of helping us discover the truth behind these same life experiences? To help you more deeply understand this liberating insight, let's view it from a slightly different angle. Each cycle of our life, as marked by each subsequent level of personal growth, comes to a happy close only when the lessons driving that cycle are finally learned. This much should be clear to us. But what remains cloudy is that each life lesson learned that served to close out each cycle came to us in the form of a needed truth. And further, that this same truth always arrives in some distinct realization about our own nature -- one that had not only been unconscious to us, but that is now recognized as having been secretly responsible for the events of that life cycle now being exited. Can you see the tremendous implications in this finding? First, it means that in the middle of any unwanted experience, waiting there all along for us to realize it, is the truth that liberates and lifts us above our former limited understanding responsible for that very experience. In other words, our experiences revolve around, and are actually created to reveal, certain life lessons yet to be learned. And if we would dare see further (which we must if we would know Truth's victory), this discovery reveals the unimaginable. There exists behind these life lessons a timeless truth -- one that has not only perceived what we need before we do, but that somehow actively arranges our life experiences for the sole purpose of revealing itself to our soul. We have set before us evidence of a completely compassionate, purposeful Intelligence -- a Living Truth whose silent operation not only reveals the meaning of our existence but serves in this capacity as seed, nourishment, and fruition of our incredibly diverse life-experiences. To grasp, even in the smallest way, that a Wisdom revealed to us as Truth (call it what you will) is the secret fabric of our lives, is to begin realizing a whole new order of self-victory. Here we come upon a success that has no opposite. Failure ceases to exist as a fear. The painful idea of loss, of falling down and losing our way, forever loses its sting because in the light of our new understanding we see now that the universe itself not only wants us to be victorious individuals, but actually wills this special victory. 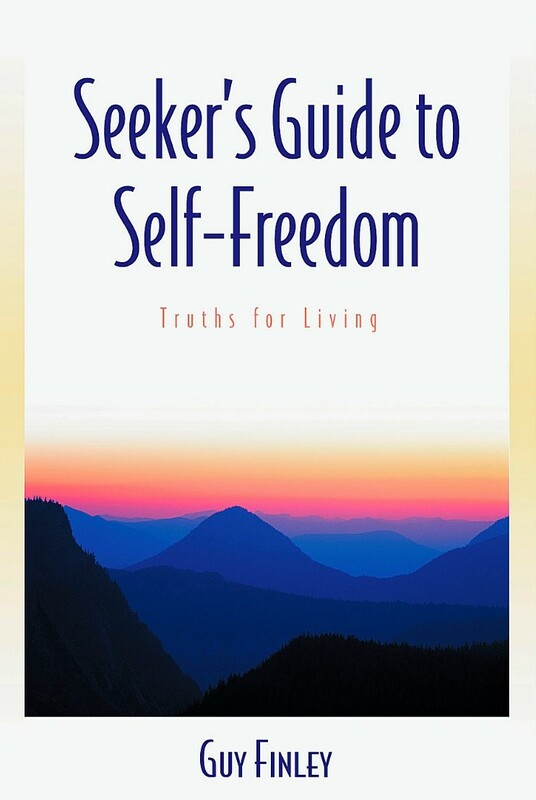 Excerpted From: Seeker's Guide to Self-Freedom: Truths for Living, pages 3-6.